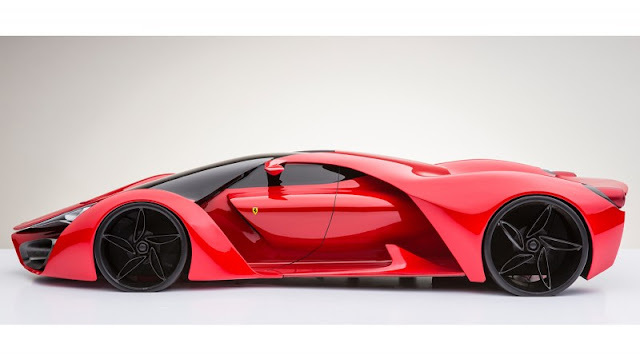 With car concepts constantly being released from major marques, it is unlikely for one created as a college project to raise any eyebrows—unless it is for the next generation of Ferrari with looks that are nothing short of ferocious. In 2014, Adriano Raeli did just that, and his renderings continue to go viral across the Internet. 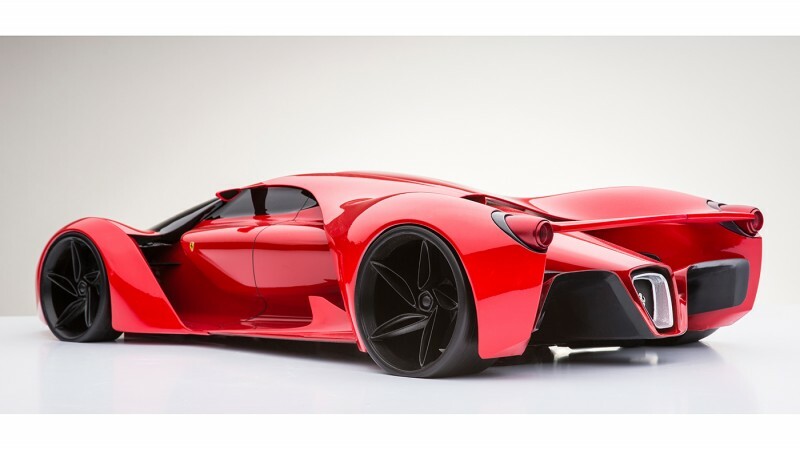 RobbReport.com spoke with the 28-year-old automotive designer about his envisioned Ferrari F80—a vehicle that takes the hyperbole out of hypercar. I have basically been sketching cars since I was very little and would draw them on anything—once on the back of a math test. My father, who is an architect and painter, definitely had an influence on me growing up and so I decided to study transportation design at ArtCenter College of Design in Pasadena, Calif. While there, I did an internship with Pagani in Italy and, upon graduation, started working at the Kia Design Center, where I have been employed for almost two years. 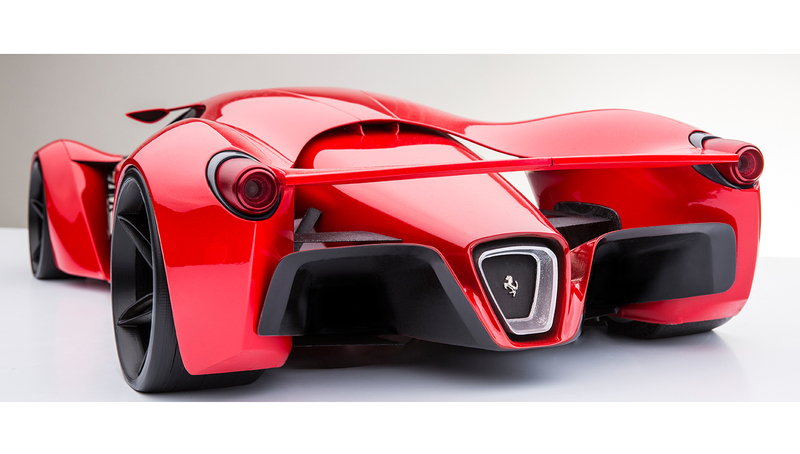 Why were you inspired to design the Ferrari F80 Raeli concept? I was in independent studies at ArtCenter and chose this to be my thesis project. 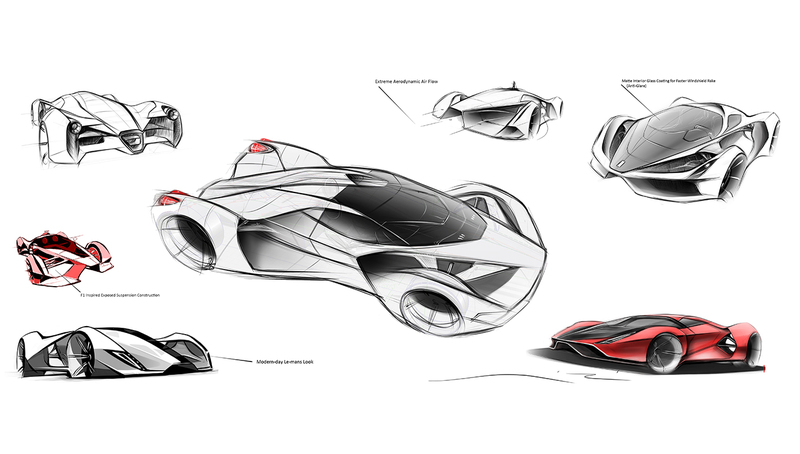 I wanted to create something striking before graduation, and what better way than to come up with a hypercar concept. Enzo Ferrari had always been a great inspiration for me, and I wanted to pay tribute to this great idol of the automotive world. My goal was to design a car that would be up to his standards as well as those of Pininfarina, which I have also always admired. I truly wanted the project to express my inner passion for the automotive arts. What were some of your influences for the design? I believe jet fighters are always a great influence for hypercars. I know it may sound cliché as an inspiration but it all depends on your own unique interpretation and how you incorporate other elements—such as airflow, human anatomy, even music—to the idea. The most advanced technological breakthroughs are usually in aeronautics, and therefore my attention goes straight to that and how it can translate to cars—after all, Jay Leno put a turbine in one of his vehicles, so anything is possible. What were your ideas for the chassis and body construction? For the chassis, I imagined carbon-fiber monocoque construction that merges building techniques found in Formula 1 with those used in supercar production. The body could be carbon fiber as well, but there are new materials being developed. For example, a couple of years back, Pagani was just starting to use a proprietary combination called “carbotanium,” which comprised a carbon-fiber weave interlaced with platinum-coated titanium in order to keep the car intact in the case of impact. Carbon fiber alone has a tendency to shatter. What are some of the aerodynamic features you incorporated? The one thing that I wanted to make sure the car had was a center fuselage with the wheels housed separately for enhanced airflow and intake. The tunnels that run between the body and wheel housing is a concept you see in designs for Le Mans but perhaps not as pronounced as I have envisioned them. The reason for this feature is to minimize the surface area at the front of the car and keep the center as tight as possible while allowing maximum airflow. This also permits an aesthetic feature to come into play as the A-arms become visible through the tunnels. Also adapted from Formula 1 is how the air intakes for the radiator are forward on the sides of the cabin. In most production supercars the intakes are located toward the rear, which is not as visually appealing, in my opinion. What would be the performance specs of the car? As it is very conceptual, the specs I imagined at the time of design were perhaps a little too high: say, a top speed of 300 mph. Despite a lot of people criticizing designers as always coming up with numbers and not being knowledgeable about engineering, the reality is that we have to work very closely with engineers toward reaching a common goal. When the Ferrari F40 came out, it actually was the first production car to hit a record-breaking 186.4 mph which, for the time, was quite remarkable. I didn’t specify a year for the concept, so perhaps in 2020 we would be getting close to certain speeds not reached today. High design can motivate engineering that exceeds expectations. Any innovative elements for the interior? The interior is primarily composed of two staggered Formula 1 seating positions, and the rest is very minimal in order to follow the nature of that race-category’s specifications. 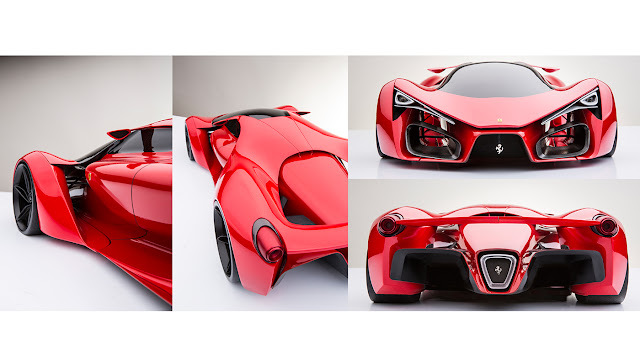 Is Ferrari aware of your concept? 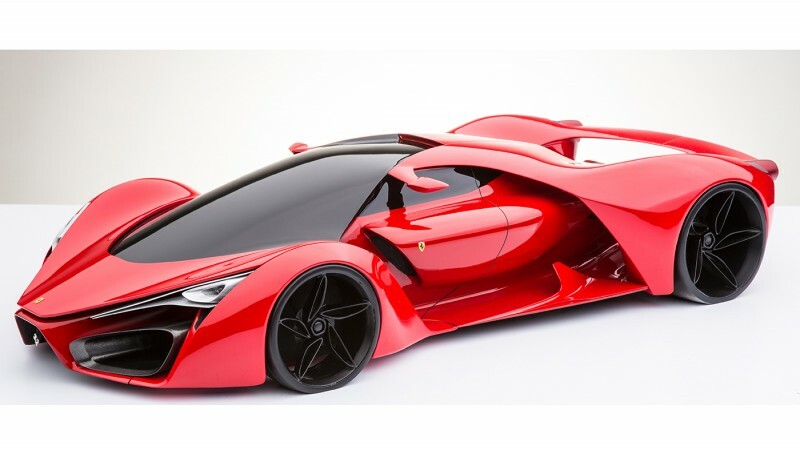 I sent my portfolio to both Pininfarina and Ferrari but have not received any official reaction. I have a friend who works for the marque and I occasionally bug him about it. The concept has gone viral so many times online that I’m sure they have seen it and will contact me if they want to—but I’m still waiting for that.